Headache is one of the 20 most frequent reasons that cause patients to visit primary care providers in the United States. In a study of 20,468 patients, migraine headache, one of the common causes of recurrent headache, occurred one or more times yearly in 17.6% of women and in 5.7% of men (1). In the evaluation of a recurrent headache, the important tasks are to categorize the headache type with as much precision as possible and to eliminate potentially serious causes. These include a brain tumor, intracranial bleed, meningitis, or other serious causes. In primary care patients with â€œheadacheâ€ as a presenting symptom, the risk of serious intracranial pathology is <1%(2). Generally, such patients have a history of a new-onset or worsening headache pattern or an abnormal neurologic finding, which might include a seizure. Characteristics of the headache What is the type of pain, its location, its duration, and its intensity? What symptoms precede or accompany the pain? Does anything trigger the headache or make the pain better or worse? Inform the patient about a typical headache from beginning to end. Foods that trigger migraine include alcohol, aged cheese, chocolate, and aspartame. Approximately 20% to 30% of migraineurs report an aura, typically visual in nature. Patients with cluster headache report unilateral temporal headache, occurring generally once daily, usually in the evening and associated with ipsilateral nasal stuffiness and conjunctival injection. Patients with chronic daily headache (CDH) experience it at least 10 to 15 days/month and usually report heavy use of relief drugs. Red flags that might suggest intracranial pathology include a loss of consciousness, persistent visual loss, seizures, staggering, or hearing loss. Chronology of the headache Most primary headaches recur periodically for years, with only subtle changes over time. If the headache is becoming worse, the cause may be psychosocial stressors, medication overuse, or evolving intracranial pathology . Ask women whether the headache seems related to menses. Past and current medication use and how they affect the headache can be important clues to headache severity and how the patient may respond to the treatment. 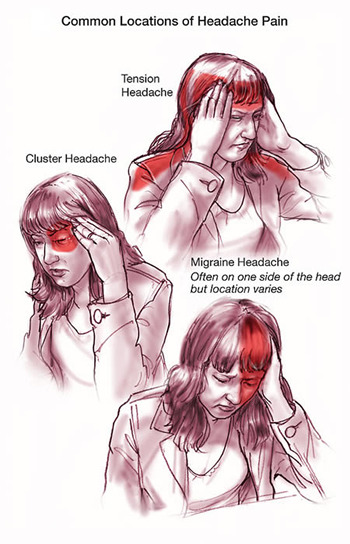 Family history Migraine headaches often exhibit a familial pattern; the causes of secondary headaches generally do not. Tension headache can represent a family pattern of reacting to stress. Psychosocial aspects of the headache What does the patient believe is the cause of the headache? What life events might be playing a role? How does the patient’s family react to the headache? 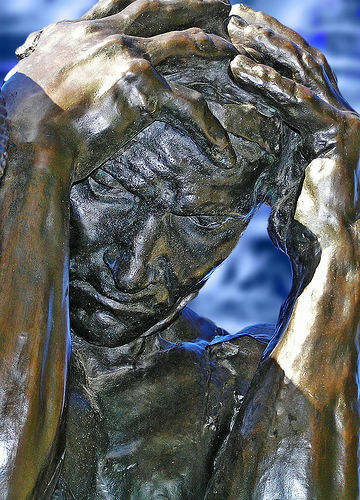 Ask: â€œIf you did not have the headache, how would your life be different?â€ The key to the management of recurrent primary headaches often lies in the responses to these questions, which can reveal unanticipated stressors, secondary gain, or family discord. Other information Important data includes the use of tobacco, alcohol, or caffeine; response to exercise, a history of head trauma; exposure to toxic fumes or chemicals. Have there been symptoms of fever, or fatigue? Ask about depression, which is often seen in migraineurs. Generally, supratentorial space occupying lesions cause neurologic sequelae and seizures, whereas infratentorial lesions generally cause headache, malaise, nausea, and stiff neck. Allodynia is a common finding in chronic migraines . A focused physical examination This should include vital signs (notably blood pressure) and an examination of the scalp; eyes, including funduscopic examination; ears; nose; paranasal sinuses; throat; and neck. A screening neurologic examination, including cranial nerves, coordination (finger-to-nose test), and deep tendon reflexes, is sufficient in most instances. In the migraineur, the examination findings should be all normal in the absence of a current headache; a positive finding warrants further testing. Other physical examination maneuvers These are appropriate if the medical history suggests specific secondary headache causes: palpation of the superficial temporal arteries (temporal arteritis), audiometry (acoustic neuroma), transillumination of the paranasal sinuses (â€œsinus headacheâ€), or checking for nuchal rigidity plus Kerning’s and Brudzinski’s signs (meningeal irritation). Clinical laboratory tests For most patients with recurrent headache, no blood, urine, or other clinical laboratory tests are needed. Laboratory tests that might be suggested by the clinical history and the physical examination include erythrocyte sedimentation rate (temporal arteritis), hematocrit or thyroid studies (fatigue), cerebrospinal fluid examination (meningeal irritation), and white blood count with differential (systemic infection). Diagnostic imaging In most instances, diagnostic imaging is not needed. In one study, 350 patients with a chief complaint of headache, regardless of the complaint headache, of the presence or absence of neurologic signs, were referred for computed tomography (CT) scan. Only 2% had clinically significant CT findings, and all patients with significant CT findings had abnormal physical examination findings or unusual clinical symptoms (4). Diagnostic imaging may be indicated in patients with atypical headache patterns, a history of seizures, or focal neurologic signs or symptoms (5). New-onset and â€œworst everâ€ headaches are significant complaints (i.e., atypical headache patterns). Despite the greater cost, magnetic resonance imaging provides the best imaging for the detection of brain tumors and most other chronic pathologic causes of headache that can be detected by imaging. More recent developments in imaging technology can help differentiate benign and malignant lesions and to more precisely define the anatomy (e.g., single-proton emission CT scan and magnetic resonance angiography)(3). The key to the diagnosis of headache is the clinical history. A history of an aching, bitemporal headache that is associated with stress and that waxes and wanes is a typical tension headache. Migraine is characteristically a one-sided headache, throbbing in nature, often associated with nausea and vomiting, frequently accompanied by photophobia and sonophobia, and lasting 4 to 12 hours, perhaps longer. It may be â€œwith auraâ€ (common migraine) or â€œwithout auraâ€ (common migraine), with the latter seen in 70% to 80% of migraineurs. Cluster headache is a strictly one-sided, recurring headache that chiefly affects men, and that occurs in â€œclustersâ€ of 1 to 2 months of episodes. An increasing number of patients have CDH, often with virtually constant discomfort; many CDHs are the result of â€œtransformed migraineâ€ following daily analgesic use, especially codeine derivatives (6). Because recurrent headache is caused, at least in part, by life stresses and because it also causes personal and family stress, the diagnostic assessment is incomplete until this complex relationship has been adequately explored over a series of visits.